A golf inspiration book. You will learn how to enjoy God's love in your golf as your read this series of 18 devotions. Each devotion has golf lessons, life lessons, and scriptural truths to inspire your game both on and off the course. "In a society where athletics is many times served as a God, a clarity of purpose is revealed in the words of this devotional as to who God is and how athletics call be used to serve Him"
"The perspective I gained from this book helped me have peace in the course to win $50,000 in the Gillette Putting Championship." "I prayed for my friend for ten years to receive Christ. I sent her a copy of A Quiet Clap. 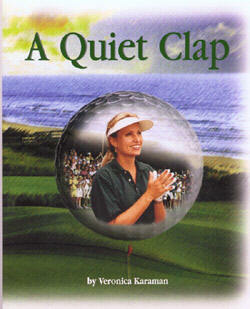 An avid golfer, she loved the book. A few weeks after telling me how much she enjoyed it, reading it several times, she died. Her response to this book is the only evidence I have that she make peace with God." "My fiancé and I read the book every day as our devotional. We really like it!"